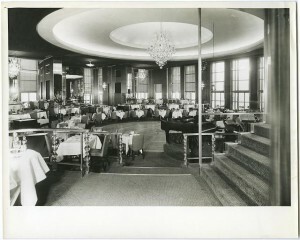 The dining room at the Rainbow Room, 1934. Rockefeller Center’s famed Rainbow Room opened its doors in October of 1934, a fine dining restaurant perched a towering 65 stories above Manhattan’s rapidly developing cityscape. At the time of its unveiling, the Rainbow Room became the highest elevated restaurant in the entire country, with stunning views that continued to charm high society diners and entertainers alike for decades. J.D. Rockefeller, Jr., the establishment’s legendary landlord, was an unlikely proprietor for such a business. The wealthy business tycoon prided himself on his temperance, leading a clean and pious lifestyle free from worldly indulgences like liquor, cigars and glitzy shows. Yet, folding under the social pressures of a booming New York City, Rockefeller decided that if he had to open a rooftop supperclub, he would make sure it was a completely unrivaled experience. The oil baron got his wish. The Rainbow Room was a lavish affair, THE place to be seen for New York’s upper crust. Dressed to the nines in accordance with the restaurant’s “white tie” policy, the era’s most refined socialites rubbed elbows celebrities like Bette Davis, Joan Crawford, Sir Lawrence Olivier and Marlene Dietrich in the glossy main room — with its Art Deco design, two-story tall windows and grand, revolving dancefloor buzzing with the sound of a live big band orchestra. 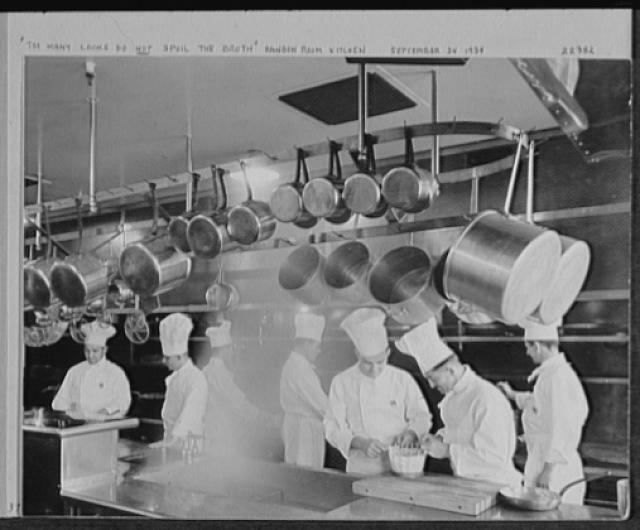 The kitchens at the Rainbow Room, 1934. To keep patrons coming back night after night, the Rainbow Room’s entertainment had to be as fabulous and star-studded as its clientele. Nightly performances ranged from Broadway crooners and internationally recognized lounge acts to novelties like magicians, puppeteers and fortune tellers. There was something for everyone at the Rainbow Room — as long as that someone could afford the entry fee. The Rainbow Room maintained its stellar reputation until the early 1980s, when stiff competition from trendy downtown clubs led the management to embark on a two year, $25 million renovation in 1985. While the novelty of the facelift helped keep the Rainbow Room afloat, it failed to fully regain its mid-century appeal, and the Rockefeller family ultimately sold its operational interests to Cipriani S.A., a group of successful Italian restaurateurs. Despite the new owners’ watchful eye, the Rainbow Room fell into trouble yet again in 2009, when the economic downturn collided with changing attitudes towards city nightlife. New Yorkers were spending less, and those who could afford to spend more — the socialites and celebrities who once waltzed atop the Rainbow Room’s shimmering dance floor — were doing so in flashy downtown nightclubs and ritzy Miami Beach resorts. The Rainbow Room closed its hallowed doors on June 5th, 2009. Of course, the story didn’t end there. In 2012, the Rainbow Room was granted landmark status from the New York Landmarks Commission, an achievement that solidified the former hot spot’s permanent role in New York City’s cultural history and, in turn, secured its future. After five years of dormancy and yet another round of remodeling, the Rainbow Room reopened for business in October of 2014. While the new guard envisioned a Rainbow Room stocked with high-tech 21st Century touches — “I want this to be today’s extravagant social networking space,” architect Michael Gabellini told Bloomberg in September, 2014 — the Landmark Commission’s strict guidelines ensured that the restaurant’s storied past remain an integral part of its new look. As they say, the band plays on. Michael Feinstein Live at the Rainbow Room airs Wednesday, December 31 at 10 p.m. on THIRTEEN.